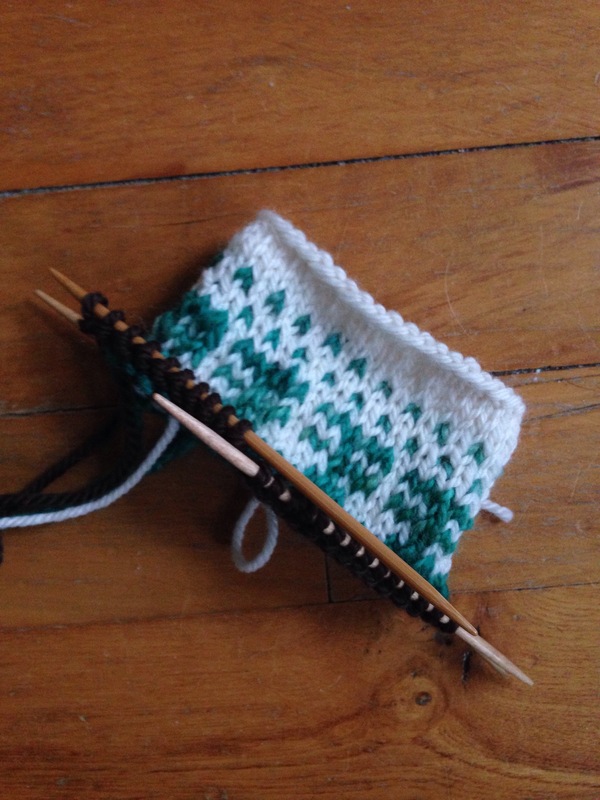 I am so delighted to have the chance to test knit Kirsten’s newest mitten design, to be released next month. I fell in love with it as soon as I saw her picture of it on Instagram, and I immediately went stash diving to see if I might have the necessary yarns. I showed you yesterday what I came up with: a combination of Stonehedge Fiber Mills Shepherd’s Wool (worsted) and my own handspun. I’ve knit with Stonehedge a lot. A lot. A LOT. A LOT, I TELL YOU. And I have found that it can handle a wide range of needle sizes – I’ve knit with it on size 2 needles as well as on size 8. So I often skip the swatching for a new project, because I have a pretty good idea of my gauge on various needle sizes. But this project involves colorwork, and my tension with colorwork is still evolving, so I want to make sure I get this right. I sometimes forget that my tension with stranded knitting is a bit tighter than my tension with plain knitting, so I’m really glad I took I experimented with needle size. Verdict: I’ll do the plain portion on size 2 needles and the colorwork on size 3. All systems are go, and I’m ready to cast on tonight!